If you want to use WordPress on a new domain all you need to do is change the siteurl and home options in our WordPress Dashboard or via FTP. 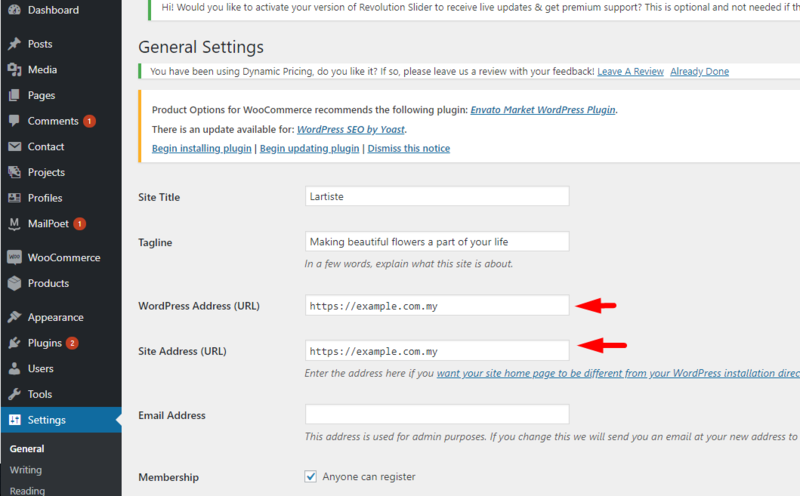 To do this go to Settings > General and replace WordPress Address and Site Address with the new domain name you want to use. The “Site Address (URL)” setting is the address you want people to type in their browser to reach your WordPress blog. The “WordPress Address (URL)” setting is the address where your WordPress core files reside. If you have access to the site via FTP, then these methods will help you quickly get a site back up and running if you changed those values incorrectly in the Dashboard. It is possible to set the site URL manually in the wp-config.php file. Add these two lines to your wp-config.php, where “example.com” is the correct location of your site. This is not necessarily the best fix, it’s just hardcoding the values into the site itself. You won’t be able to edit them on the general settings page anymore when using this method. Download a copy of the active theme’s functions.php file. You’re going to edit it in a simple text editor and upload it back to the site. *Use your own URL instead of example.com, obviously. Upload the file back to your site, in the same location. Load the login or admin page a couple of times. The site should come back up.